A commercial writing surface, durable aluminium frame, rounded safety corners, marker tray and adjustable eyelets make this cheap white board great value for money. 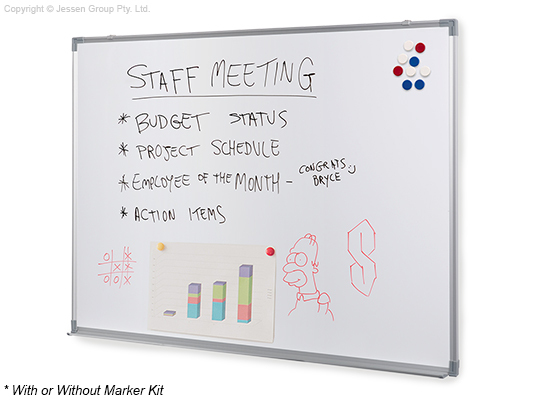 Durable enough to use as a school or office white board, this dry erase board uses an acrylic writing surface with a 70 - 80% gloss rating, so it’s easy to clean and colours appear vivid and clear. The surface also features a steel backing that allows for the use of magnets to attach sheets of paper or notes to the board. Integrated into the whiteboard frame are a pen tray and adjustable mounts for fastening the board to the wall. These mounts slide horizontally on the frame to suit the point of instalment, but only allow for the board to be mounted in landscape format. If you’re looking to buy a whiteboard, but are not sure if this is exact model for you, we have a range of other sizes and styles that you can browse by visiting our whiteboards page.